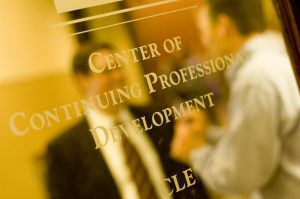 THE CENTER OF CONTINUING PROFESSIONAL DEVELOPMENT extends the knowledge and resources of the LSU Law Center to the Louisiana Bar. The Center offers some 20 professional development seminars each year in various locations throughout Louisiana. It is the premier provider of continuing legal education in the state.